Let's see, what's the phrase I'm looking for? As part of my race packet for the Annapolis Run for the Light House, I received a packet of protein powder. It seemed to go over well post-run, so I bought myself a big ol' tub of it at Target; different brand but same flavor. Well, that worked fine for awhile in my smoothies, but after awhile I just got SO SICK of that cloying vanilla taste. Bleh. By consequence I have been on the hunt for some way to cut the flavor in my smoothies (experiment one verdict: cocoa powder is insufficient) or, alternatively, a new way to use it entirely. 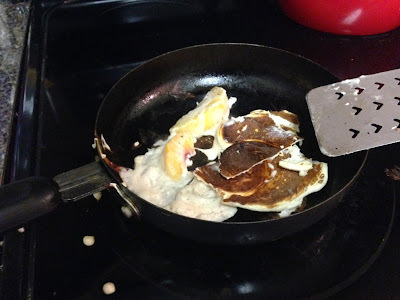 I thought I'd hit upon something when I came across another blogger's post on protein pancakes, which I am not going to link because I don't want to imply that this is in any way her fault. I started with her recipe, but it was too much of a pain to Tetris my way through the pantry for the flour so I just used the protein powder for both measurements (I recognize that this was stupid; believe that it has been noted in the logs). Then I added the other ingredients, tossed in some frozen peaches for good fruity measure, and cooked up a pancake. I tried another one, thinking maybe my pancake flipping method lacked proper timing. Jack White had a brain that felt like pancake batter. I had... this. Then I ate a chicken sausage and a bunch of Honey Nut Cheerios with almond milk. DINNER OF CHAMPIONS. This summer I started using protein powder to combat problems with lightheadedness, and I really enjoyed finding interesting and fun shake flavor combinations! One of my favorites was to put a packet of orange Emergen-C in with the vanilla powder... pretty darn close to a creamsicle! I also put half a scoop of vanilla powder in my oatmeal at breakfast with some truvia and almond milk. Never tried pancakes, though... but I'm a little afraid to, now :P Great post, as always! Apples with a little cinnamon and nutmeg... maybe a little apple butter. Or coconut and pineapple. Chocolate chips, peanut butter, and bananas... I'm now realizing your question was what to put protein powder in, not what else could you put in pancakes. But nonetheless all these things taste delicious in pancakes from a bisquick batter.